If you are an exotic food lover, you should be excited to see this. Thai restaurant, Osha, which just opened its seventh location on 3rd Street in downtown San Francisco, is now featuring GreeNoodle. 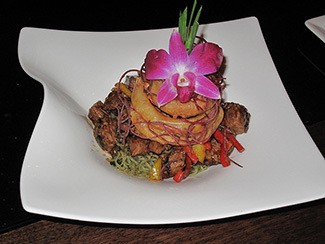 The restaurant’s vision is to combine traditional Thai cuisine with healthy, unique products and ingredients. They aim to create food which is not only good for the body, with its delicious, unbeatable taste, but is also delightful for the eyes. This is why each of their dishes is truly a masterpiece. 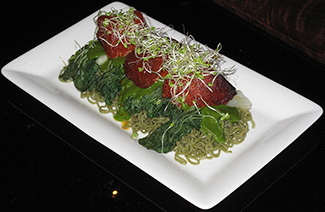 GreeNoodle perfectly fits such a vision and allows the Osha chefs to come up with innovative dishes. 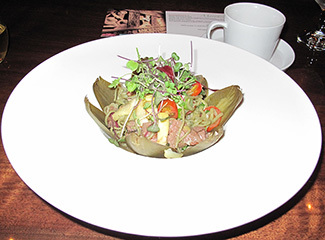 Let’s start with appetizers:This is their Beef and Artichoke Salad with GreeNoodle– Grilled steak and artichoke, shallots, tomatoes, cilantro and spinach tossed in a spicy lime vinaigrette.Mmm.. Yummy! 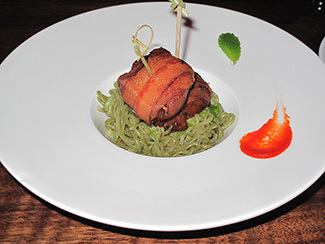 Bacon Wrapped Scallop- A tender sea scallop lightly wrapped in smoky bacon, served with a three flavor cream sauce over GreeNoodle. 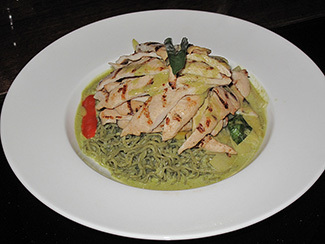 Green Curry– Traditional Thai Green Curry with grilled chicken served with GreeNoodle, Thai basil, bell pepper, and bamboo shoots. Restaurant’s signature dish: Volcanic Beef- Wok-fried grilled premium flank steak with basil and black pepper in Lava sauce, garnished with onion rings and GreeNoodle. 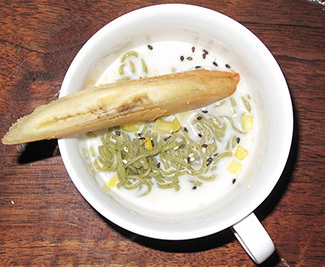 Dessert: “Salim”-GreeNoodle in melted ice cream with pieces of pineapple served with deep-fried banana. Osha’s cooks sure have a lot of passion and creativity! If you also like to be creative using your culinary skills, please send us your favorite GreeNoodle recipe with some pictures. We will gladly post them on our website.